As the last time it was my younger sister Anika who edited the newsletter, this time, I, Anvita Agarwal, am editing it. This newsletter too has a theme like the last one. Its theme is “Adventure, Comedy and more”. 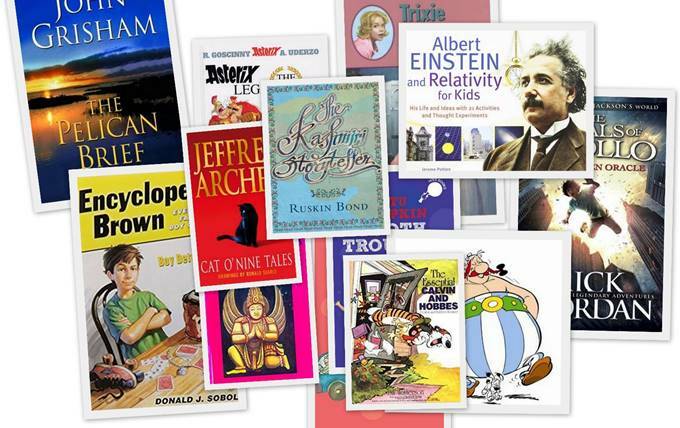 It mostly contains books that have adventure, mysteries, and books that are funny. 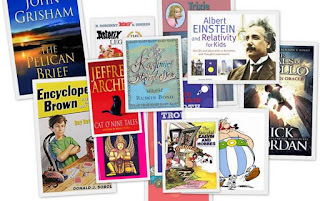 Most of these books are my personal favourite and I’m sure you will enjoy them. The same icons have been used as last time. Badges are for normal sections, trophies are for the best mystery books and medals are for the editor’s pick of the month. Hope you enjoy this month’s newsletter and find our suggestions useful. – Anvita. 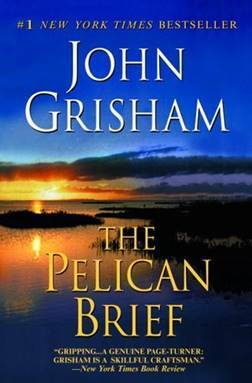 The Pelican Brief: In the last newsletter I talked about another John Grisham book called ‘The Firm’. I had seen the movie and I had planned to read the book, as I did not understand the movie completely. I read the book and I found it to be better than the movie. The plot is extremely good and it is unique. John Grisham books are truly gripping and thrill you to the core. The general plot is about a young law student named Darby Shaw, who writes a brief on the answer to the death of two High Court judges, Rosenberg and Jensen. Her brief is shown to her law school teacher, who passes it onto a friend of his who shows it to the FBI. A few days later her teacher is killed in a bomb blast. Someone is after her and really wants to keep the truth from coming out. She has to save her life and at the same time expose the killers of those two High Court judges. I loved the book and the way he describes Darbie’s strong character. He leads you through the story very well and you can imagine the scene before your eyes. Everything is clearly mentioned in the book. When I look back to the movie and compare it with the book, I think it was very poorly directed. They do not describe the brief very clearly, and it is extremely tough to understand what the brief was about. I loved the book as every part of the book helped in the continuity of the story. The story was not being unnecessarily being dragged on for pages and pages. 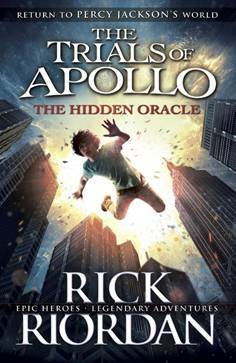 Trials of Apollo: The Hidden Oracle: This is yet another series written by Rick Riordan. It still talks about Greek Mythology, and most of the characters are the same, though the main characters like Percy and Annabeth are minor ones in this series. The story revolves around Apollo, the god of music, prophecy and healing. He has been thrown down to Earth by his father Zeus, and Zeus has taken most of his godly powers from him. He meets a young girl named Meg McCaffrey, a demigod who has not been taken to Camp Half-Blood. He has landed in the city where Percy Jackson lives, and decides to take his help. Percy Jackson takes them safely to Camp Half-Blood, but they find out there that no more prophecies are being given out, and that many members of the camp are disappearing by the day. During a three-legged race, Apollo and Meg accidently stumble upon the territory of Python, the enemy of Apollo. Python is talking to someone called the Beast. Both plan to take control of all the oracles of Delphi. They want to burn up the grove of Dodona, which was the last place where prophecies were told. Apollo and Meg must save the grove and find the missing campers. I loved the book, mainly because it is hilarious, and I found the plot ingenious. Rick Riordan has managed to create so many series, yet the idea of each plot is original. There are three books in this series. The first one is ‘The Hidden Oracle’, the second one is ‘The Dark Prophecy’, and the last one, ‘The Burning Maze’ is yet to be released. 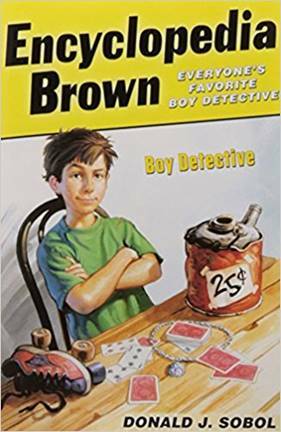 Encyclopedia Brown: This book is about a ten-year-old boy named Encyclopedia Brown. His real name obviously can’t be encyclopedia, his real name is Leroy Brown. He is named encyclopedia because he can remember thousands of facts and lots of information. He lives in the seaside town of Idaville. Idaville has the reputation of being the town where the law was never broken. This was due to Encyclopedia who cracked each case his father brought home for dinner. His father was the chief of police and any case that he couldn’t solve was taken home to his son, who would solve it before dessert. Encyclopedia also runs a detective agency with Sally Kimball, his partner. They spend most of their summer holidays doing this. Many kids in the neighborhood come to the agency for help. Sally and Encyclopedia spend most of their time trying to stop Bugs Meany, the neighborhood bully from cheating children. There are many books in this series. The answer to all the cases are written at the back of the book. They are very interesting. Encyclopedia uses the small and unnoticeable details to solve the cases. I love these books as it is very interesting how Encyclopedia solves the cases. I recommend these books to anyone who likes mystery. Trixie Beldon: I had come across this series in a bookstore. My sister had said it was very nice and interesting so I bought th,ree of them. I read them and they turned out to be very interesting. In my opinion this series of books is almost like the Nancy Drew series. It has a girl named Trixie and her friend Honey Wheeler. Honey’s family is very rich and own a lot of land. At first Trixie thought that Honey was very snobbish and stuck up but soon they become the best of friends.Together they solve a number of mysteries and cases. All the cases are well described and are very interesting. 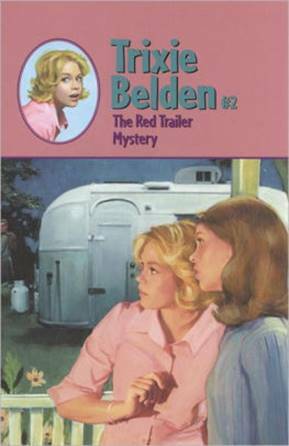 The one book that I have read, called ‘The Read Trailer Mystery’, talks about how Honey and Trixie find a boy named Jim who had run away. He had recently inherited lots of money but his cruel uncle troubled him a lot so he ran away. They later find him and Honey’s family adopts him as their son. I enjoyed reading these two books and look forward to reading more. The books are full of mystery and are very interesting. Anyone who liked Nancy Drew and is a fan of mystery books should read this series. 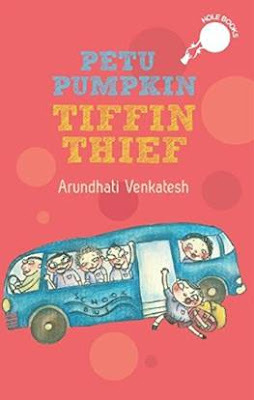 Petu Pumpkin: There are two books in this series. Both talk about a boy named Pushkin who is hungry all the time. This gives him his nickname Petu Pumpkin. The first book talks about how Petu gobbles up his friend’s food so they are left with nothing. His four friends – Sachin, Nitin, Kiran and Jatin form a secret club called the Awesome Foursome to solve this problem. They finally come up with a solution that makes sure Pushkin would never eat their food again. The second book talks about how Petu and his friends need a new football to practice with for their upcoming match with the fourth graders. To get it they need to ask the tooth fairy and for that they need a tooth. Pushkin’s tooth finally comes out but the fairy needed two teeth. The rest of the story talks about how they get the football and what happens at the match. These books might be too small for me but I never get bored of reading them. The stories are so funny that I can’t help rereading them. 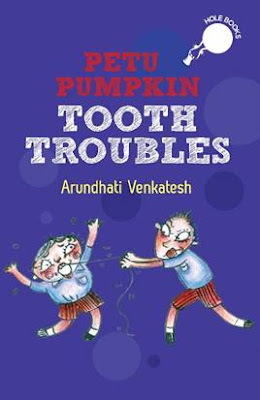 The author Arundhati Venkatesh has written few other books called Bookasura and Junior Kumbhakarna. They are very hilarious and funny. · Jeeves and the Hard-boiled Egg"
· The Aunt and the Sluggard"
My favourite story is “Jeeves takes charge”. This is the story in which Jeeves comes into the employment of Bertie Wooster. Bertie Wooster employs Jeeves and soon after that gets a telegram from Florence, a girl to whom he is engaged. Florence was at Bertie’s Uncle Willoughby’s house, as Bertie was dependent on his Uncle Willoughby for financial support and he wanted Florence to impress his uncle, so that his uncle would consent to their marriage. Bertie had suggested that Florence ask his uncle to read out a few passages from the book he was recently writing, to please him. Florence obeyed and found that the book contained many awkward incidents of her father who was Uncle Willoughby’s friend. Florence was furious and wanted Bertie to steal the book and destroy it before it reached the publisher’s, or the engagement was off. Bertie is in a fix. He does not want to break his engagement, nor does he want his uncle to find out about it and stop helping him financially. 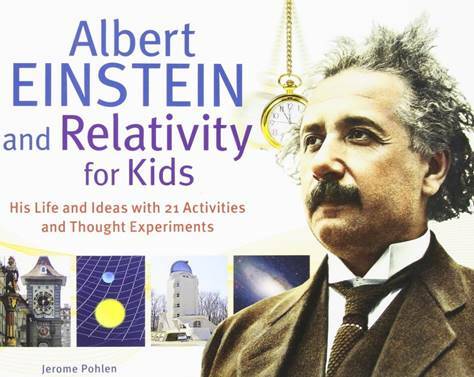 Albert Einstein and Relativity for Kids: His Life and Ideas with 21 Activities and Thought Experiments: This was a science book that I read and truly enjoyed. I rarely read Science books as I do not find them too interesting. It talks about the life of Albert Einstein and his different theories. I loved the part when they talk about his theories, as they are fascinating and are very simple to understand. I found the Special theory of Relativity the best as it was very interesting and though it sounded extremely complicated, it was explained in a simple manner using many experiments which helped you understand it better. There were these experiments that they called thought experiments which were experiments where you had to imagine something was happening in order to understand the experiment fully. This book has helped spark my interest in Science and I learnt a lot from it. Children aged 11-above will be able to read and enjoy it. I found the thought experiments a very clever way to put across the information in an easier manner. This book has made me enjoy other science books which help me a lot in my studies. 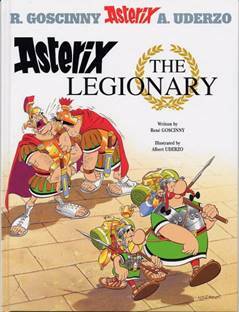 Asterix: These are a fictional and hilarious series of comics that is situated in the village of indomitable Gaul’s that still stand out to Roman invaders. 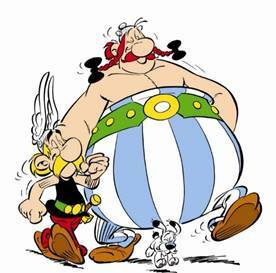 The heroes of this series are Asterix and Obelix. Asterix is a short warrior with a yellow moustache. Obelix is a well-built warrior who is also a menhir-maker and Asterix’s companion in all his adventures. He has red pigtails and is very strong as he fell into a cauldron of magic potion when he was a baby. They have only one fear. They are afraid the sky will fall on their head someday. A few other inhabitants of the village are Getafix -the druid, Cacofonix – the bard, Fulliotmatix – the blacksmith, Unhygienix – the fishmonger and Chief Vitalastix – the head of the village. The Gaul’s love nothing more than good food and drink and a good old fight. Their favorite sports are hunting wild boars and beating the Romans to a pulp. The books are very enjoyable and hilarious. The Illustrations too are hilarious. I loved all the books. Garuda Purana: We had covered the Puranas in the May newsletter. In this newsletter I am going to talk about the Garuda Purana which I had recently reviewed. You can find more about it on my blog. The Garuda Purana is the seventeenth Purana in the list of mahapurans. This is a satvik Purana – a Purana that glorifies Vishnu. This Purana is no very long. It has only nineteen thousand shlokas. These shlokas are divided into two parts – the Purva khanda and the Uttara khanda. The Purana talks a lot about the division of the earth, the solar and lunar dynasties and the construction of a house. It also talks a lot about the different types of naraka (hells). 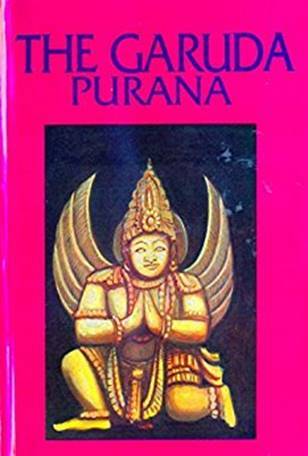 The Purana is very interesting and you obtain a lot of punya if you read or hear it so read the original to obtain more punya. 1. "The Man Who Robbed His Own Post Office"
3. "Don't Drink the Water"
4. "It Can't Be October Already"
6. "The Wisdom of Solomon"
7. "Know What I Mean?" 8. "Charity Begin at Home"
12. "In the Eye of the Beholder"
My favorite one was the fifth story, “The Red King”. It talks about how a man tricked two men and then went to jail for the wrong crime! 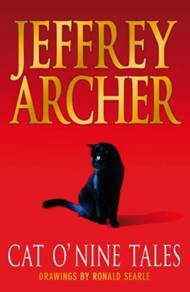 The stories in it are narrated by Jeffery Archer himself. He has shown himself to be a writer in prison who takes down the incidents that made his fellow prison-mates go to prison. 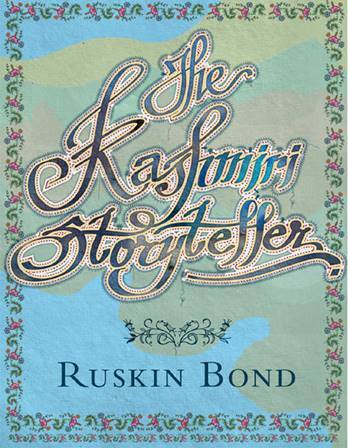 The Kashmiri Storyteller: This is a book written by Ruskin Bond that tells many Kashmiri stories. The storyteller here is Javed Khan who is the owner of a shop where many children gather during cold evenings. The main children who gather there are Kamal, Shashi, Vijay and Amit. Javed Khan then tells them many interesting folktales and stories from his days in Kashmir. Out of the many stories there was one which I liked the best. The name of the story was 'Hira and Lal'. It was quite interesting and taught you not to be too inquisitive. I liked all the stories a lot and found them very interesting. My dad had recommended this book so I borrowed it and it was quite nice, just as I had expected since it was written by Ruskin Bond who writes amazing kids’ books. I liked the book a lot. You must be wondering who Susie is. Susie is a girl who lives across the street and is in Calvin’s class. 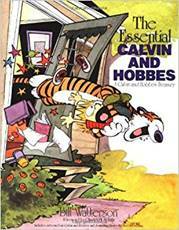 Both are constantly fighting with each other, and it is Calvin who starts most of the fights. In addition to this, the comic strip includes Rosalyn, Calvin’s babysitter. On nights when Calvin’s mom and dad are out, they hire Rosalyn to keep an eye on him. There are only four to five comic strips where she appears. My favourite parts in the comic strip however are when Calvin goes out to build snowmen during winter, and they show the snowmen he makes. Those parts are the best. All the illustrations are humorous, and you cannot stop laughing when you see them. © 2017, AnvitaAgarwal. All rights reserved.